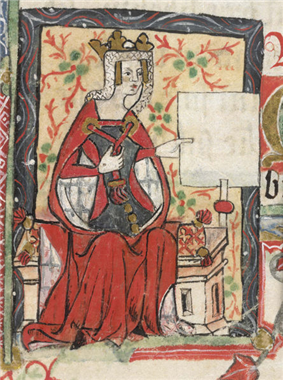 Empress Matilda (c. 7 February 1102 – 10 September 1167), also known as the Empress Maude, was the claimant to the English throne during the civil war known as the Anarchy. [nb 1] The daughter of King Henry I of England, she moved to Germany as a child when she married the future Holy Roman Emperor Henry V. She travelled with her husband into Italy in 1116, was controversially crowned in St. Peter's Basilica, and acted as the imperial regent in Italy. Matilda and Henry had no children, and when he died in 1125, the crown was claimed by Lothair II, one of his political enemies. Meanwhile, Matilda's younger brother, William Adelin, died in the White Ship disaster of 1120, leaving England facing a potential succession crisis. On Henry V's death, Matilda was recalled to Normandy by her father, who arranged for her to marry Geoffrey of Anjou to form an alliance to protect his southern borders. Henry I had no further children and nominated Matilda as his heir, making his court swear an oath of loyalty to her and her successors, but the decision was not popular in the Anglo-Norman court. Henry died in 1135 but Matilda and Geoffrey faced opposition from the Norman barons and were unable to pursue their claims. The throne was instead taken by Matilda's cousin Stephen of Blois, who enjoyed the backing of the English Church. Stephen took steps to solidify his new regime, but faced threats both from neighbouring powers and from opponents within his kingdom. In 1139 Matilda crossed to England to take the kingdom by force, supported by her half-brother, Robert of Gloucester, and her uncle, King David I of Scotland, while Geoffrey focused on conquering Normandy. 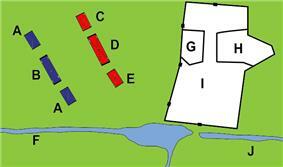 Matilda's forces captured Stephen at the Battle of Lincoln in 1141, but the Empress's attempt to be crowned at Westminster collapsed in the face of bitter opposition from the London crowds. As a result of this retreat, Matilda was never formally declared Queen of England, and was instead titled the Lady of the English. 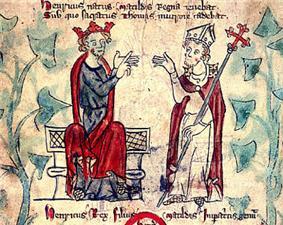 Robert was captured following the Rout of Winchester in 1141, and Matilda agreed to exchange him for Stephen. Matilda became trapped in Oxford Castle by Stephen's forces that winter, and was forced to escape across the River Isis at night to avoid capture. The war degenerated into a stalemate, with Matilda controlling much of the south-west of England, and Stephen the south-east and the Midlands. Large parts of the rest of the country were in the hands of local barons. In late 1108 or early 1109, Henry V, then the King of the Romans, sent envoys to Normandy proposing that Matilda marry him, and wrote separately to her royal mother on the same matter. The match was attractive to the English King: his daughter would be marrying into one of the most prestigious dynasties in Europe, reaffirming his own, slightly questionable, status as the youngest son of a new royal house, and gaining him an ally in dealing with France. In return, Henry V would receive a dowry of 10,000 marks, which he needed to fund an expedition to Rome for his coronation as the Holy Roman Emperor. The final details of the deal were negotiated at Westminster in June 1109 and, as a result of her changing status, Matilda attended a royal council for the first time that October. She left England in February 1110 to make her way to Germany. 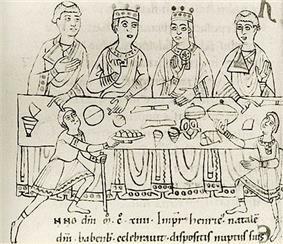 In 1118, Henry returned north back over the Alps into Germany to suppress fresh rebellions, leaving Matilda as his regent to govern Italy. [nb 6] There are few records of her rule over the next two years, but she probably gained considerable practical experience of government. In 1119 she returned north to meet Henry in Lotharingia. Her husband was occupied in finding a compromise with the Pope, who had excommunicated him. In 1122, Henry and probably Matilda were at the Council of Worms. The council settled the long-running dispute with the Church when Henry gave up his rights to invest bishops with their episcopal regalia. Matilda attempted to visit her father in England that year, but the journey was blocked by Charles I, Count of Flanders, whose territory she would have needed to pass through. Historian Marjorie Chibnall argues Matilda had intended to discuss the inheritance of the English crown on this journey. Matilda and Henry remained childless, but neither party was considered to be infertile and contemporary chroniclers blamed their situation on the Emperor and his sins against the Church. [nb 7] In early 1122, the couple travelled down the Rhine together as Henry continued to suppress the ongoing political unrest, but by now he was suffering from cancer. His condition worsened and he died on 23 May 1125 in Utrecht, leaving Matilda in the protection of their nephew Frederick, the heir to his estates. Before his death he left the imperial insignia in the control of Matilda, but it is unclear what instructions he gave her about the future of the Empire, which faced another leadership election. Archbishop Adalbert subsequently convinced Matilda that she should give him the insignia, and the Archbishop led the electoral process, which appointed Lothair of Supplinburg, a former enemy of Henry, as the new King of the Romans. Now aged 23, Matilda had only limited options as to how she might spend the rest of her life. Being childless, she could not exercise a role as an imperial regent, which left her with the choice of either becoming a nun or remarrying. Some offers of marriage from German princes started to arrive, but she chose to return to Normandy. She does not appear to have expected to return to Germany, as she gave up her estates within the Empire, and departed with her personal collection of jewels, her own imperial regalia, two of Henry's crowns and the valuable relic of the Hand of St James the Apostle. 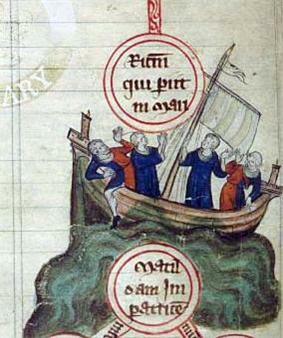 In 1120, the English political landscape changed dramatically after the White Ship disaster. Around three hundred passengers – including Matilda's brother, William Adelin, and many other senior nobles – embarked one night on the White Ship to travel from Barfleur in Normandy across to England. Possibly as a result of overcrowding, or excessive drinking by the ship's master and crew, the vessel foundered just outside the harbour and all but two of the passengers died. William Adelin was among the casualties. With William dead, the succession to the English throne was thrown into doubt. Rules of succession in western Europe at the time were uncertain; in some parts of France, male primogeniture, in which the eldest son would inherit a title, was becoming more popular. It was also traditional for the King of France to crown his successor whilst he himself was still alive, making the intended line of succession relatively clear. This was not the case in England, where the best a noble could do was to identify what Professor Eleanor Searle has termed a pool of legitimate heirs, leaving them to challenge and dispute the inheritance after his death. The problem was further complicated by the sequence of unstable Anglo-Norman successions over the previous sixty years. William the Conqueror had invaded England, his sons William Rufus and Robert Curthose had fought a war between them to establish their inheritance, and Henry had only acquired control of Normandy by force. There had been no peaceful, uncontested successions. Initially Henry put his hopes in fathering another son. William and Matilda's mother - Matilda of Scotland - had died in 1118 and so Henry took a new wife, Adeliza of Louvain. Henry and Adeliza did not conceive any children, and the future of the dynasty appeared at risk. Henry may have begun to look among his nephews for a possible heir. He may have considered his sister Adela's son, Stephen of Blois, as a possible option and, perhaps in preparation for this, he arranged a beneficial marriage for Stephen to Matilda's wealthy maternal cousin and namesake, the Countess of Boulogne. Theobald of Blois, his close ally, possibly also felt that he was in favour with Henry. William Clito, the only son of Robert Curthose, was King Louis VI of France's preferred choice, but William was in open rebellion against Henry and was therefore unsuitable. Henry might have also considered his own illegitimate son, Robert of Gloucester, as a possible candidate, but English tradition and custom would have looked unfavourably on this. Henry's plans shifted when the Empress Matilda's husband, the Emperor Henry, died in 1125. Henry began to formally look for a new husband for Matilda in early 1127 and received various offers from princes within the Empire. His preference was to use Matilda's marriage to secure the southern borders of Normandy, by marrying her to Geoffrey of Anjou, the eldest son of Fulk, the Count of Anjou. 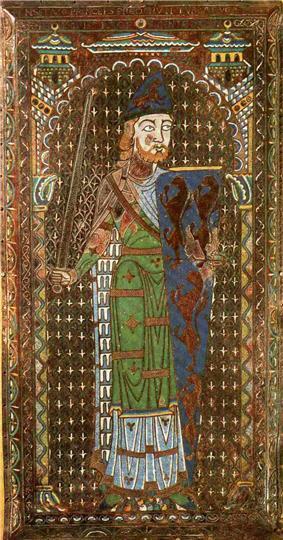 Henry's control of Normandy had faced numerous challenges since he had conquered it in 1106 and the latest threat came from his nephew William Clito, the new Count of Flanders, who enjoyed the support of the French King. 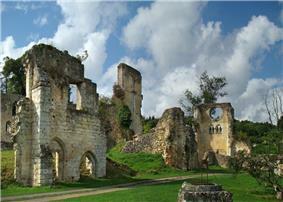 It was essential to Henry that he did not also face a threat from the south as well as the east of Normandy. William Adelin had married Fulk's daughter Matilda, which would have cemented an alliance between Henry and Anjou, but the White Ship disaster put an end to this. Henry and Fulk argued over the fate of the marriage dowry and this had encouraged Fulk to turn to support William Clito instead. 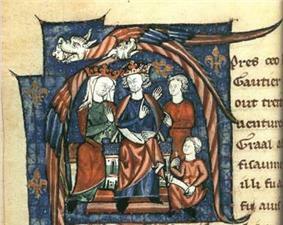 Henry's solution was now to negotiate the marriage of Matilda to Geoffrey, recreating the former alliance. Matilda appears to have been unimpressed by this plan. She felt that marrying the son of a count diminished her own status and was probably also unhappy about marrying someone so much younger than she was – Matilda was 25, and Geoffrey was only 13. Hildebert, the Archbishop of Tours, eventually intervened to persuade her to go along with the engagement. Matilda finally agreed, and in May 1127 she travelled to Rouen with Robert of Gloucester and Brian Fitz Count where she was formally betrothed to Geoffrey. Over the course of the next year, Fulk decided to depart for Jerusalem, where he hoped to become king, leaving his possessions to Geoffrey. Henry knighted his future son-in-law and a week later, on 17 June 1128, Matilda and Geoffrey were married in Le Mans by the bishops of Le Mans and Séez. 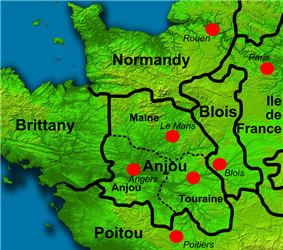 Fulk finally left Anjou for Jerusalem in 1129, declaring Geoffrey the Count of Anjou and Maine. From then on, relations between Matilda and Henry became increasingly strained. Matilda and Geoffrey suspected that they lacked genuine support in England for their claim to the throne, and proposed in 1135 that the King should hand over the royal castles in Normandy to Matilda and should insist that the Norman nobility immediately swear allegiance to her. This would have given the couple a much more powerful position after Henry's death, but the King angrily refused, probably out of a concern that Geoffrey would try to seize power in Normandy while he was still alive. A fresh rebellion broke out in southern Normandy, and Geoffrey and Matilda intervened militarily on behalf of the rebels. In the middle of this confrontation, Henry unexpectedly fell ill and died near Lyons-la-Forêt. It is uncertain what, if anything, Henry said about the succession before his death. Contemporary chronicler accounts were each coloured by subsequent events, and while sources favourable to Matilda suggested that Henry had reaffirmed his intent to grant all his lands to his daughter, hostile chroniclers argued that Henry had renounced his former plans and had apologised for having forced the barons to swear an oath of allegiance to her. Matilda gave birth to her third son William on 22 July 1136 at Argentan, and she then operated out of the border region for the next three years, establishing her household knights on estates around the area. Matilda may have asked Ulger, the Bishop of Angers, to garner support for her claim with the Pope in Rome, but if she did, Ulger was unsuccessful. Geoffrey invaded Normandy in early 1136 and, after a temporary truce, invaded again later the same year, raiding and burning estates rather than trying to hold the territory. 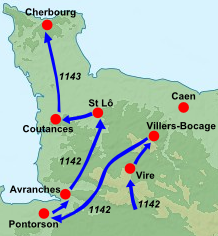 Stephen returned to the Duchy in 1137, where he met with Louis VI and Theobald to agree to an informal alliance against Geoffrey and Matilda, to counter the growing Angevin power in the region. Stephen formed an army to retake Matilda's Argentan castles, but frictions between his Flemish mercenary forces and the local Norman barons resulted in a battle between the two halves of his army. The Norman forces then deserted the King, forcing Stephen to give up his campaign. Stephen agreed to another truce with Geoffrey, promising to pay him 2,000 marks a year in exchange for peace along the Norman borders. Stephen responded quickly to the revolts and invasions, paying most attention to England rather than Normandy. His wife Matilda was sent to Kent with ships and resources from Boulogne, with the task of retaking the key port of Dover, under Robert's control. A small number of Stephen's household knights were sent north to help the fight against the Scots, where David's forces were defeated later that year at the Battle of the Standard. Despite this victory, however, David still occupied most of the north. Stephen himself went west in an attempt to regain control of Gloucestershire, first striking north into the Welsh Marches, taking Hereford and Shrewsbury, before heading south to Bath. The town of Bristol itself proved too strong for him, and Stephen contented himself with raiding and pillaging the surrounding area. The rebels appear to have expected Robert to intervene with support, but he remained in Normandy throughout the year, trying to persuade the Empress Matilda to invade England herself. Dover finally surrendered to the Queen's forces later in the year. Empress Matilda's invasion finally began at the end of the summer. Baldwin de Redvers crossed over from Normandy to Wareham in August in an initial attempt to capture a port to receive Matilda's invading army, but Stephen's forces forced him to retreat into the south-west. The following month, the Empress was invited by her stepmother, Queen Adeliza, to land at Arundel instead, and on 30 September Robert of Gloucester and Matilda arrived in England with a force of 140 knights. [nb 15] Matilda stayed at Arundel Castle, while Robert marched north-west to Wallingford and Bristol, hoping to raise support for the rebellion and to link up with Miles of Gloucester, who took the opportunity to renounce his fealty to the King and declare for Matilda. As time went by, Matilda directed more of her attention to the Cistercian order, This order was very fashionable in England and Normandy during the period, and was dedicated to the Virgin Mary, a figure of particular importance to Matilda. She had close links to the Cistercian Mortemer Abbey in Normandy, and drew on the house for a supply of monks when she supported the foundation of nearby La Valasse. She encouraged the Cistercians to build at Mortemer on a grand scale, with guest houses to accommodate a range of visitors of all ranks, and may have played a part in selecting the paintings for the monastic chapels. ^ Chibnall 1991, pp. 9–10; Chibnall, Marjorie (2004–13), "Matilda [Matilda of England] (1102–1167), Empress, Consort of Heinrich V", Oxford Dictionary of National Biography, Oxford University Press, retrieved 22 December 2013. ^ Chibnall 1991, pp. 13–14; Chibnall, Marjorie (2004–13), "Matilda [Matilda of England] (1102–1167), Empress, Consort of Heinrich V", Oxford Dictionary of National Biography, Oxford University Press, retrieved 22 December 2013. ^ a b c d e f g h Chibnall, Marjorie (2004–13), "Matilda [Matilda of England] (1102–1167), Empress, Consort of Heinrich V", Oxford Dictionary of National Biography, Oxford University Press, retrieved 22 December 2013. ^ Pain 1978, p. 12; Chibnall, Marjorie (2004–13), "Matilda [Matilda of England] (1102–1167), Empress, Consort of Heinrich V", Oxford Dictionary of National Biography, Oxford University Press, retrieved 22 December 2013. ^ Chibnall 1991, p. 32; Chibnall, Marjorie (2004–13), "Matilda [Matilda of England] (1102–1167), Empress, Consort of Heinrich V", Oxford Dictionary of National Biography, Oxford University Press, retrieved 22 December 2013. ^ a b c Chibnall 1991, pp. 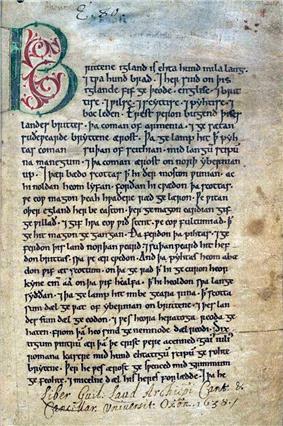 32–33; Leyser 1982, p. 199; Chibnall, Marjorie (2004–13), "Matilda [Matilda of England] (1102–1167), Empress, Consort of Heinrich V", Oxford Dictionary of National Biography, Oxford University Press, retrieved 22 December 2013. ^ Chibnall 1991, p. 33; Chibnall, Marjorie (2004–13), "Matilda [Matilda of England] (1102–1167), Empress, Consort of Heinrich V", Oxford Dictionary of National Biography, Oxford University Press, retrieved 22 December 2013. ^ Chibnall 1991, pp. 32–33; Chibnall, Marjorie (2004–13), "Matilda [Matilda of England] (1102–1167), Empress, Consort of Heinrich V", Oxford Dictionary of National Biography, Oxford University Press, retrieved 22 December 2013. ^ Chibnall 1991, pp. 43–44; Chibnall, Marjorie (2004–13), "Matilda [Matilda of England] (1102–1167), Empress, Consort of Heinrich V", Oxford Dictionary of National Biography, Oxford University Press, retrieved 22 December 2013. ^ Chibnall 1991, pp. 43–44; Vincent 2006, p. 148; Chibnall, Marjorie (2004–13), "Matilda [Matilda of England] (1102–1167), Empress, Consort of Heinrich V", Oxford Dictionary of National Biography, Oxford University Press, retrieved 22 December 2013. ^ Chibnall 1991, pp. 151, 153; Chibnall, Marjorie (2004–13), "Matilda [Matilda of England] (1102–1167), Empress, Consort of Heinrich V", Oxford Dictionary of National Biography, Oxford University Press, retrieved 22 December 2013. ^ Chibnall 1991, p. 151; Chibnall, Marjorie (2004–13), "Matilda [Matilda of England] (1102–1167), Empress, Consort of Heinrich V", Oxford Dictionary of National Biography, Oxford University Press, retrieved 22 December 2013. ^ Chibnall 1991, p. 165; Chibnall, Marjorie (2004–13), "Matilda [Matilda of England] (1102–1167), Empress, Consort of Heinrich V", Oxford Dictionary of National Biography, Oxford University Press, retrieved 22 December 2013. ^ Chibnall 1991, p. 166; Chibnall, Marjorie (2004–13), "Matilda [Matilda of England] (1102–1167), Empress, Consort of Heinrich V", Oxford Dictionary of National Biography, Oxford University Press, retrieved 22 December 2013. ^ Chibnall 1991, p. 204; Chibnall, Marjorie (2004–13), "Matilda [Matilda of England] (1102–1167), Empress, Consort of Heinrich V", Oxford Dictionary of National Biography, Oxford University Press, retrieved 22 December 2013. ^ Chibnall 1991, p. 190; Chibnall, Marjorie (2004–13), "Matilda [Matilda of England] (1102–1167), Empress, Consort of Heinrich V", Oxford Dictionary of National Biography, Oxford University Press, retrieved 22 December 2013. ^ Chibnall 1991, p. 175; Chibnall, Marjorie (2004–13), "Matilda [Matilda of England] (1102–1167), Empress, Consort of Heinrich V", Oxford Dictionary of National Biography, Oxford University Press, retrieved 22 December 2013. ^ Maude is an alternative spelling of the name Matilda, and frequently used interchangeably. She was known in Latin as Mathildis Imperatrix and in Anglo-Norman as Imperatrice Mahaut. ^ The cause behind the soured relations is not fully known, though historian Marjorie Chibnall stated that, "historians have tended to put the blame on Matilda ... This is a hasty judgement based on two or three hostile English chroniclers; such evidence as there is suggests Geoffrey was at least as much to blame". ^ Historians Jim Bradbury and Frank Barlow suggest than an oath was taken in 1131; Marjorie Chibnall is more doubtful that this occurred. The civil war years of Matilda's life have been the subject of historical fiction. Matilda, Stephen and their supporters feature in Ellis Peters's historical detective series about Brother Cadfael, set between 1137 and 1145. Peters paints the Empress as proud and aloof, in contrast to Stephen, a tolerant man and a reasonable ruler. Matilda's martial reputation may also have contributed to Alfred, Lord Tennyson's decision to entitle his 1855 battle poem Maud. Matilda has attracted relatively little attention from modern English academics, being treated as a marginal figure in comparison to other contemporaries, particularly her rival Stephen, in contrast to the work carried out by German scholars on her time in the Empire. Popular, but not always accurate, biographies were written by the Earl of Onslow in 1939 and Nesta Pain in 1978, but the only major academic biography in English remains Majorie Chibnall's 1991 work. Interpretations of Matilda's character have shifted over time, but there is, as Chibnall describes, a "general agreement that she was either proud or at least keenly conscious of the high status of an empress". 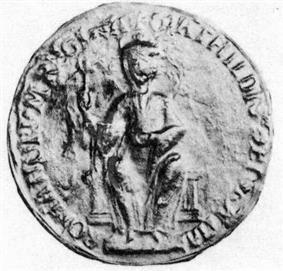 Like both Henry I and Henry II, Matilda had a certain autocratic grandeur, which was combined with a firm moral belief in her cause; ultimately however she was limited by the political conventions of the 12th century. The treatment of Matilda by modern historians has been challenged by feminist scholars, including Fiona Tolhurst, who believe some traditional assumptions about her role and personality show gender bias. In this interpretation, Matilda has been unfairly criticised for showing qualities that have been considered praiseworthy when seen in her male contemporaries. The German academic Oskar Rössler's 1897 biography drew heavily on German charters, not extensively used by Anglophone historians.